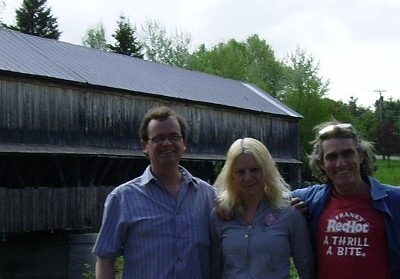 After a long drive (with Frances, Allie and his daughter, Alana) to Marwood in Tracyville, New Brunswick I got to inspect hundreds of Red pine logs that had been de-barked and stacked ready for shipping. There were some really nice poles there and I selected a 45 ft and a 35 ft pole. Now it’s just a matter of arranging the shipping to my friend’s yard in PEI so I can shape them and dress them ready for stepping. Most of the Red pine comes from New York state, I was surprised to learn. 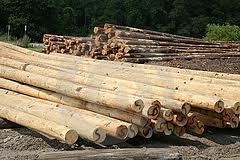 They also process lots of Southern Yellow pine from the Carolina area. I hope to have them here within two weeks. I feels good to have made some progress in this regard as I was starting to feel a bit stalled in my search for suitable masts. While waiting for the masts I will finalize my sail plans and try to secure a supply of Dacron sailcloth. This entry was posted in junk rig, masts. Bookmark the permalink.